This is an uncommon ZODIAC Aerospace GMT pilot’s watch in steel, measuring 36.5mm. This example is as good as it gets, with its acrylic black, gray and green triangle accented turning bezel. the glossy black dial with silver gilt print is all original. 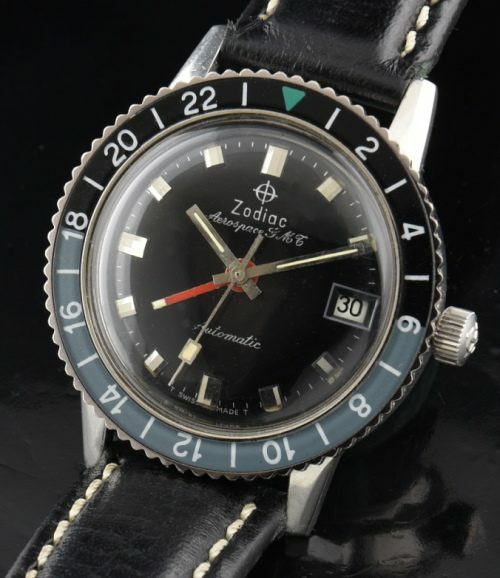 The hands are original, including the red GMT indicator. The winding crown is correct as well. The writing on the compression back case is also readable. The case looks great with its bevel edged lugs. The automatic winding ZODIAC movement was JUST cleaned and accurate. It is uncommon to find an example as clean as this. Grab this watch while you can-before prices go up. This watch just “pops” on the wrist.